Rep. Mark Johnson— here in the Oregon Legislature—spoke at the ORECA midyear meeting about the justconcluded Legislative Assembly. As the Oregon Legislative Assembly departed Salem, Oregon’s electric cooperative leaders wasted no time debriefing on the marathon session. 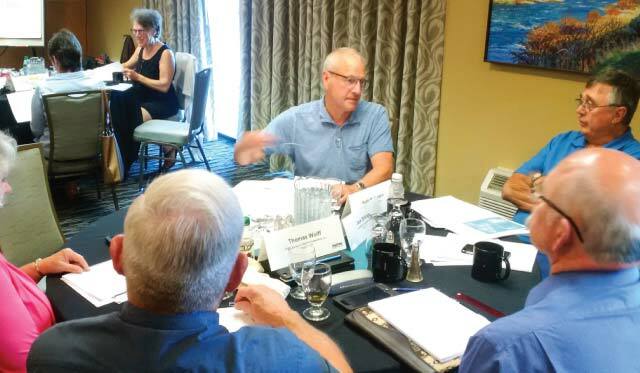 The group met in Hood River for the Oregon Rural Electric Cooperative Association’s midyear meeting July 12-13. In his report to the ORECA Board of Directors, Executive Director Ted Case noted electric cooperatives had a successful session, crediting co-op leaders who traveled to Salem for ORECA’s legislative days in March. “It’s the most important two days of the assembly for us, and makes all the difference,” Case said. 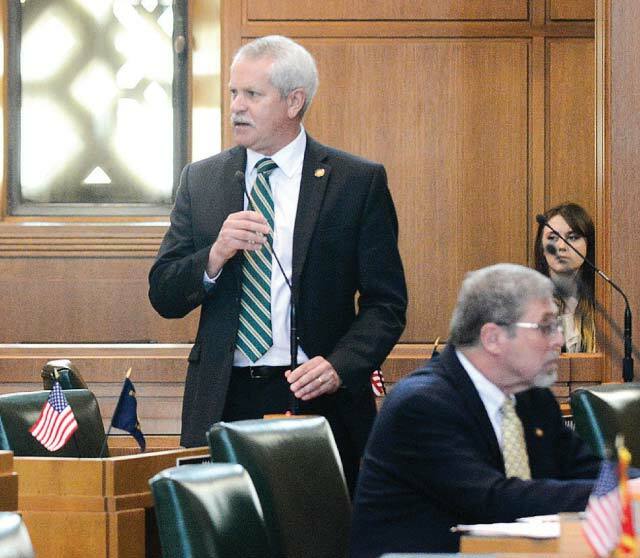 He highlighted the defeat of two bills—SB 523 and SB 524—that would have made it more difficult for cooperative directors to perform their fiduciary responsibilities. “These bills would have encouraged litigation and discouraged participation in co-op boards,” Case said. He also noted the legislature failed to pass legislation (HB 2020) to create a new department of energy and climate. ORECA, along with numerous utilities, opposed the legislation based on myriad scandals facing the department and escalating costs of the energy supplier assessment. A Marion County court recently ruled the Department of Energy has improperly collected the assessment from utilities, leading the way for potential refunds from the state of Oregon. In addition to legislative success, Case noted lawmakers also supported electric cooperatives on an issue that involved the state’s position on the Columbia River System. A bipartisan coalition of legislators signed an ORECA-supported letter from Rep. Sherrie Sprenger (R-Scio) urging Gov. Kate Brown to collaborate with consumer-owned utilities and the Bonneville Power Administration on their quest to spill more water over the dams for fish. The letter detailed that Oregon’s spill proposal was estimated to cost consumers $40 million and add 840,000 tons of carbon into the atmosphere by sidelining emission-free hydropower. Northwest River Partners Executive Director Terry Flores, who spoke at the morning session, concurred that the letter made a difference. Rep. Mark Johnson, who represents Hood River in the legislature, provided the luncheon keynote address. Johnson called the bitterly partisan session one of missed opportunities, though he said the bipartisan transportation package was a significant achievement. Johnson, a key member of the House Energy and Environment Committee, told co-op leaders to prepare for significant carbon reduction legislation. While he said there was little political will to pass cap-and-trade legislation immediately following the ambitious “coal-to-clean” proposal in the 2016 session, he told Oregon co-op leaders there will be a major push in the 2018 session. He also said Oregon’s consumer-owned utilities are well-positioned in this debate because of their reliance on federal hydropower. The general session of the midyear meeting featured speakers on carbon issues, including Yoram Bauman, a self-described stand-up economist who uses comedy to advance his support of carbon reduction legislation to combat global warming. Jason Heuser, a legislative representative for Eugene Water and Electric Board, gave his perspective on the looming carbon debate. Sheldon Petersen, CEO of the National Rural Utilities Cooperative Finance Corporation, spoke of the current financial situation and getting access to capital from Wall Street. The final sessions of the day had an international flair, as Carolyn Kurtz of Frontier Fellowship urged Oregon electric cooperatives to get involved in electrification efforts in Ethiopia. Case gave a brief talk on his new book, “Poles, Wires and War,” which is the story of electric cooperatives in Vietnam during the war. “No co-ops in the history of rural electrification have faced such adversity,” Case said. ORECA celebrates its 75th anniversary at its annual meeting at the Salem Conference Center on Thursday, November 30. Lane Electric Director and ORECA President Chris Seubert leads a discussion of co-op leaders at ORECA’s midyear meeting.